Is there a better live performer on this planet today than Bruce Springsteen? On the 'evidence' presented on Saturday 1st of March 2014, In Auckland, New Zealand, you'd have to say a big emphatic NO! From the very start of his career as a musical performer, Bruce has been determined to give the hard working fan who has paid good hard-earned money to see him in the flesh, an intense experience that will create a bond which might just possibly last a lifetime between them. His commanding stage presence, relentless energy, committed rapport with any audience is something to behold in a live context. Viewing him at home is one thing, experiencing him in concert is transformative. Even from our position way back, thankfully with the massive projected screens, Bruce was super-sized to larger than life proportions. Which is absolutely befitting of a entertainer of his stature. His love for both what he provides - and the connections he makes in those few precious hours, add up to a potent combination that few others can match. Combine his supreme skills with the best backing band in the world, the legendary E-Street Band, and pretty much, if they are 'on-song', then there are only one or two other acts capable of similar feats such as they do. Night after night by all accounts from all over the world. Don't believe my hype? Google 'bad Springsteen Concert' and see how many people didn't feel the sames as millions of others do. 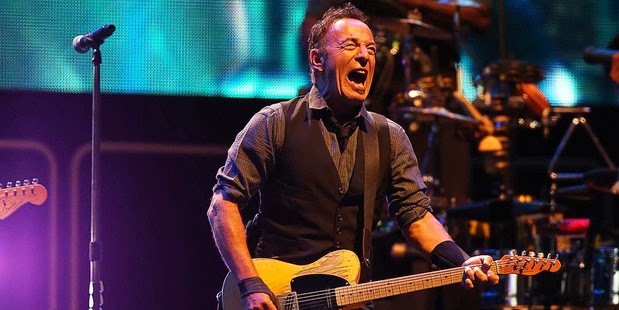 Springsteen is clearly loved by his fans - and he loves them back. That is something you can't fake. Enough of the hyperbole, what actually happened on this precious night to make me write so passionately about the 3 hours and fifteen minutes I spent under his glorious spell? Well, if you open your concert acknowledging where in the world you are via a cover of a local artists song, then that will ensure you start off on the right foot, so to speak. Armed with just an acoustic guitar, once he started singing, the crowd went crazy. "Royals". Lorde. That is serious respect. We got that. He got that we got that, and from that point onwards, Springsteen had our complete and undivided attention. We were very willingly, putty in his formidable hands. I'll spare you the full report of each and every song. It is more than tempting, but for sake of losing your interest, here's my personal highlights from this magical night. "Born in the USA" The complete album, as per the original running order! All songs performed with embellishments and extended running times, this was a massive pleasure to hear. The songs may be over familiar, but hot damn, they all sounded so vital, so fresh, so enjoyable, even if they've been played to death a zillion times prior! The concert-goers on Sunday got the full "Born To Run" album. Lucky bastards! Loved to have heard "She's the One", "Backstreets" and "Jungleland" in particular, but what we got was more than good anyways. They didn't get the vast majority of we got. "Badlands". Gutsy, powerful, intense. Loved Bruce's guitar solo on this number. A rollicking, Irish-influenced "Death to my Hometown". A rousing raucous song that is something else live. A majestic, stately "The River". My song of the night though was an unexpected pleasure. I purposely avoided reading previous concert set-lists - and wasn't sure who was in the touring band. So, when I realised that Tom Morello (Rage Against the Machine/Audioslave) was actually playing, my hopes were raised for hearing a song that he has guested on previously, the title track from Bruce's' 1995 album "The Ghost of Tom Joad". Seeing it on youtube is one thing. Watching this explosive track given a major revision via Morello's inventive 'rap-scratch' style guitaring was gob-smacking! Even the other half who normally gets turned off by fret-board wankery could fully appreciate the sheer artistry involved in this powerful rendition. (I'd 'primed' her up by taking her to the Neil Young + Crazy Horse gig last year. Of that, she was, shall we say, a little less than enthusiastic about the loud guitars. I was in heaven meanwhile...). Gotta mention that the E-Street band played magnificently, Steve Van Zant had a permanent smile on his face the whole time. Jake Clemons, nephew of the iconic Big Man - Clarence Clemons -was clearly enjoying his opportunities when he was afforded them. Talent runs deep in the Clemons family. The 'Professor' Roy Bittan tinkled the ivories as only he can, showing why he is so popular in the industry (He's done hundreds of guest appearances on many many albums). The mighty Max Weinberg, on solid, booming drums, his backbeat providing the foundations for the others to weave their magic through. Nils Lofgren, displaying his undeniable chops with his guitar, only wish he got more solo's. He's too good not to be given more time to show off! Check out clips on youtube for proof. The other musicians were all talented too, but the aforementioned members are the ones that stood out for me on the night. Bruce Springsteen. What else can you say? He's not God, he's not the messiah. But hell, if there ever was a church I'd wanna join, then the 'Church of The Boss' would fit pretty damn well. I suspect I wouldn't be alone in feeling this way either!